Ravnica Allegiance’s first legal weekend is behind us, and I think it’s safe to say that the top 8 of the SCG Open (the GP was limited) is not what most of us would have expected. Four midrange decks and two control decks? Only a single Mono-Red Aggro deck in the top 16? Evolving Wilderness at like, 30th or something? It’s clear that Simic is bringing the tools these days, and whether you pair it with black or white, you’re going to have a lot of powerful tools. It appears that much of the strength of the deck leans on the trio of Jadelight Ranger, Merfolk Branchwalker, and Wildgrowth Walker. 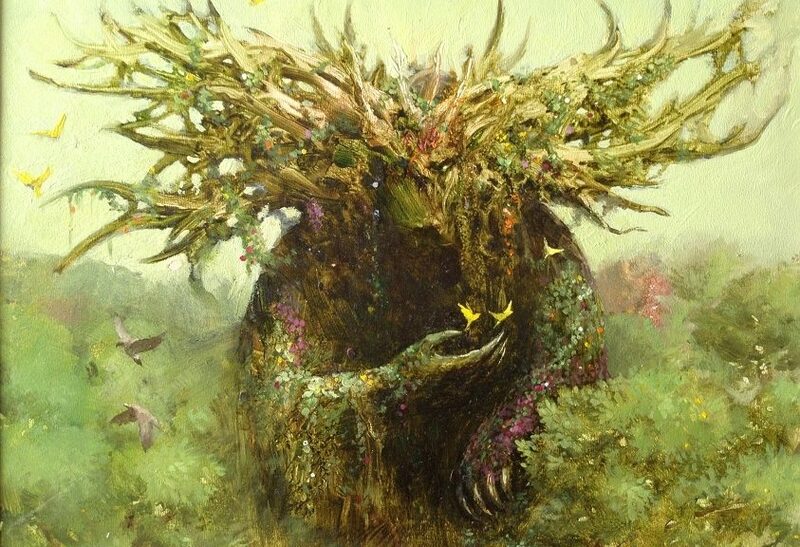 Who knows if this core of creatures will persist through the Pro Tour, but given that they were a common set of creatures even before RNA dropped, I expect this to be a common sight in the months to come. Looking beyond the piles of midrange decks that used virtually no Ravnica Allegiance cards, I noticed a fair bit of Lyra Dawnbringer sprinkled in the Bant, control, and otherwise various WX decks. Lyra Dawnbringer is of course Dominaria’s Baneslayer Angel (sort of). Lyra is a generically useful card: midrange cost that can slot in as the top end of an aggro strategy or as a finisher in bigger decks, solid stats-to-cmc ratio, evasive, and lifelink to get away from anyone attempting to race your life total. Lyra appeals to me as a card well situated to grow in price relative to other, more frequently seen cards this weekend. Jadelight Ranger was everywhere, but that’s already a $9 rare. While it could still rise a few bucks, and may even top $15 if this level of midrange persists, it’s not the type of bet I want to be making. Same goes for most of the other rares that we saw a good deal of this weekend. Lyra, on the other hand, is from an older set (good), mythic (good), and showed up in a variety of strategies (good). Her mana cost is easy, which means she slots into plenty of color combinations (good), and with how flexible Standard mana is right now, it won’t be hard for decks to add white (good). I’d consider the biggest barrier to be that a player is unlikely to want four, and we saw a lot of sideboard action for Lyra this weekend. This is counterweighted by the fact that even if she’s “only” a sideboard card, if she’s a key sideboard card that’s important to the strategy, that’s still good demand. And not being needed in full playsets is tempered by the diversity of strategies making use of her. If Lyra’s play pattern moves up from here, which it may as people decide it’s a strong tool to combat various midrange and creature based strategies, her price will too. 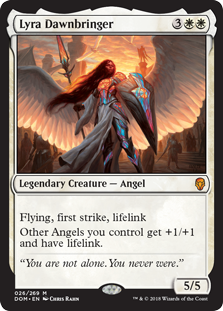 $11 is relatively low for a playable mythic angel, and if she becomes solidified in Standard as a go-to tool for anyone with white mana, we could easily see her cresting $20. This is going to be a curious card, and you’ll see why shortly. Whir of Invention showed up in third place at the Modern classic this weekend, in the Whir Prison deck. It’s an Ensnaring Bridge deck, and it uses four of the blue Chord of Calling to find whichever component is necessary at the moment. It’s an obnoxious deck that works by looping Ipnu Rivulet with Crucible of Worlds to mill you out. Whir isn’t exactly new to the format, having been introduced during Aether Revolt, and it seems to have become the main version of the Lantern deck, now appropriately titled ‘Lanternless’ on mtgtop8.com. 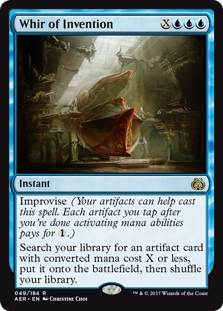 Whir is seemingly going to be a standard in the Ensaring Bridge prison decks for the forseeable future, and possibly any other artifact-based combo deck that arises. After all, Chord of Calling has found itself in a variety of creature strategies over the years, and I expect Whir will do the same. All of this points to foils setting themselves up to look great over the next several months to two years, as a key engine piece in at least one major Modern strategy, as well as a fairly popular EDH deck – it’s in over 6,500 lists on EDHREC.com, an impressive stat for such a new card. Where Whir is odd is in the inventory. Look up Whir foils on TCG and there’s only 12 vendors, half of which want $10 or more. That’s great, right? Except one of the vendors selling copies for $7 is ChannelFireball. And they’ve got 50 listed copies. Huh? 50? What the heck happened here? Do other vendors have that many and they simply haven’t listed them? One wonders. Regardless, Whir foils at $7 are tempting. I’m currently staring at my CFB credit and wondering how many I should buy, 0 or 50. Meanwhile in EDH, we’re starting to get more RNA commander lists in, and to nobodies surprise Vannifar is showing up in the top lists this week. (Although, perhaps surprisingly, both Tesya and Nikya are more popular. Nikya?) It’s not hard to figure out what the most common cards in Vannifar are; every Pestermite effect and Intruder Alarm is the first 10 or 15 cards into the list. Looking just past that, you’ll find Thousand-Year Elixir. This is an old Lorwyn favorite that has a nifty effect. It grants pseudo haste, in that your creatures can tap for their abilities immediately, but can’t attack yet. 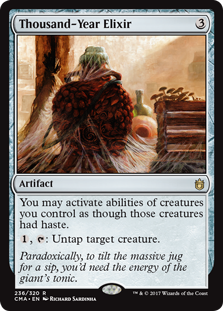 One could argue in EDH that ‘attack haste’ is worse than ‘ability haste,’ making Elixir a powerful effect. Tack on that Elixir can also untap a creature once, and you can see why Vannifar players are going to want to make sure this ends up in their 99. Elixir has been printed three times; Lorwyn, Commander 2013, and Commander Anthologies. Lorwyn is older than 5% of the room at a GP, Commander 2013 is about 25% of Magic’s lifetime ago, and Commander Anthologies was a limited run. All of this is to say supply on non-foils is actually quite low. I count something like 40 total across the three printings on TCG. You’ll find roughly that many elsewhere across the major vendors, with SCG holding most of the additional inventory. 100 copies of Elixir isn’t much when you consider that EDHREC is showing 40 submitted lists for Vannifar in the last few days. How many Vannifar lists do you think will have been built by spring? A couple in each state would rapidly outpace the available Elixir supply. Commander reprints aren’t until November either. Looking pretty good for Elixirs in the next few months, I’ve got to say.